BSA’s Force finishes Spring season on high note!! The Force, our girls U12 team, wrapped up a fine Spring season by reaching the final of the National Cup Regional tournament in Pittsgrove, NJ, playing teams from Illinois and Maryland and then by going on to win the U12 championship at the recent Guilford Soccerfest in Connecticut. The Force was keyed by their outstanding defense, which yielded only six goals over the course of the 8 tournament games. The defense was anchored by the stellar play of goalie Maria Lawrence who received excellent support from her fullback contingent. On offense the Force broke out in a big way, finding the net 23 times over the 8 tournament games. They received scoring from 8 different players set up by the excellent play of the midfielders. 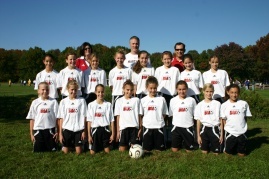 Congrats to our U12 girls! !